Ribbon vert, backed argent upon which is written in argent the word national motto in the Urdu language. The state emblem of Pakistan was adopted in 1954 and symbolizes Pakistan's ideological foundation, the basis of its economy, its cultural heritage and its guiding principles. The four components of the emblem are a crescent and star crest above a shield, which is surrounded by a wreath, below which is a scroll. The crest and the green colour of the emblem are traditional symbols of Islam. 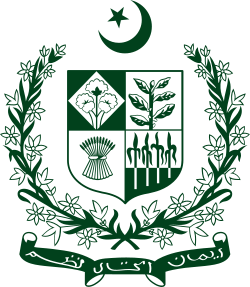 The quartered shield in the centre shows cotton, wheat, tea and jute, which were the major crops of Pakistan at independence and are shown in a form of shield and signify as the main agricultural base for the importance of the Nation's economy. The floral wreath, surrounding the shield, is Jasminum officinale (the national flower) and represents the floral designs used in traditional Mughal art and emphasizes the cultural heritage of Pakistan. The scroll supporting the shield contains the national motto in Urdu, "Īmān, Ittiḥād, Naẓm", which reads from right to left: (ایمان، اتحاد، نظم), translated as "Faith, Unity, Discipline" which are intended as the guiding principles for Pakistan. The state/province emblem of Azad Jammu and Kashmir carries the crescent and star, mountains, and the maple leaf, which is reflective of the abundance of this tree within the state. ^ "State Emblem of Pakistan". Archived from the original on 2014-12-19. ^ a b c d "The State Emblem". Ministry of Information and Broadcasting, Government of Pakistan. Archived from the original on 2007-07-01. Retrieved 2007-11-29. ^ "Basic Facts". Ministry of Information and Broadcasting, Government of Pakistan. Retrieved 2007-11-29.